Ten years back, building a website was a herculean task, with intense demands on your time, effort, and money. Today, building a website is a breeze, with so many advanced online website builders offering their services. Today, however, the challenge that web users face is regarding which website builder to choose. This is where a few proven effective services come to the fore, and Wix makes the cut in all such lists of the best online website builders. With so many new and established website builders offering comparable services, it’s commendable how Wix has stepped its game up a few notches, and innovated to stay relevant, as well as a user favorite in the drag and drop styled website builder tool marketplace. With groundbreaking and trendsetting functionalities such as Artificial Design Intelligence (ADI), Wix has managed to please discerning web users. Also, it’s among the most frequently upgraded website builders, with new features and functionalities being added every other month. Among Wix’s most differentiated features is the fact that it includes and offers tools, widgets, and functionalities targeted at a whole range of website categories, such as Business, Online Store, Photography, Music, Food and Restaurants, Events, Fashion, and Portfolio. Right from schedulers and calendars to CRM and marketing functionalities, you will find extremely relevant and value adding features for your business website niche with Wix. Then, Wix takes website design ease to the next level, with its hundreds of professionally designed and updated list of free and premium website templates and its Artificial Intelligence powered design engine that helps you create the first draft of the website in a jiffy. Then, Wix’s user help mechanism is amazing, with help buttons assigned to most on-screen components, which makes the learning curve easily navigable. 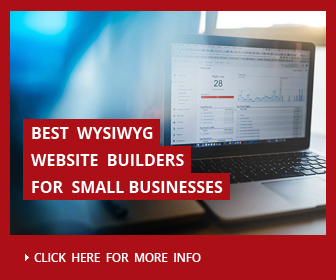 All said and done, you must also be aware of the ‘not so good’ parts of Wix as a website builder. Topping this list of turn-offs is the tool’s incapability to retain your content when you switch from one template to another. After switching, you’ll need to re-add the content, which is pretty close to redesigning the entire website. Your free Wix empowered website will be peppered with Wix banners and branding. Most free online website builders do pose their banners on your free pages, but Wix’s are more prominent, and hence, a turnoff. Another problem Wix users are likely to face, in the long run, is that all its plans are more expensive than comparable plans offered by competing website builders. Notwithstanding its limitations, Wix is a marvelous tool for new web users to quickly create a free website. Let’s understand the most value adding and powerful tools, options and functionalities offered by Wix, which can enable you to create a useful and functionally capable website. We’ve tried to focus more on features and options that are more relevant for first time website builder users, and for those looking to create a functional website without spending a buck, and without spending much time. For first time users of online website builder tools, Wix is right up there among the easiest options. The entire Wix experience is designed and delivered to help you create your website within an hour. Here are the key aspects of Wix that make it amazingly user friendly and swift. Most on-screen design components have their own help button, which lets you quickly understand what its use is, without having to search in knowledge databases. The Wix range of templates is constantly updated, which means whenever you come on-board, you will have free templates to choose from, which are in sync with the latest from the world of design. Whether you want a one page template, looking to add video background, or break your pages into multiple sections, you can do it all in a few clicks using Wix’s super convenient and user friendly drag and drop styled website creation interface. Apart from the templates, Wix also offers you dozens of free videos and images to add to your web pages. This saves you a lot of time in we page design. A tip – since template switching is troublesome with Wix, we suggest you try out a few templates in the beginning before populating your content. Also, note that Wix does not allow you to edit the HTML and CSS code of the design, so the scope of customization for a given Wix template is limited. Because of the endless number of combinations of designs in terms of fonts, styles, images, page sections, contact forms, etc. 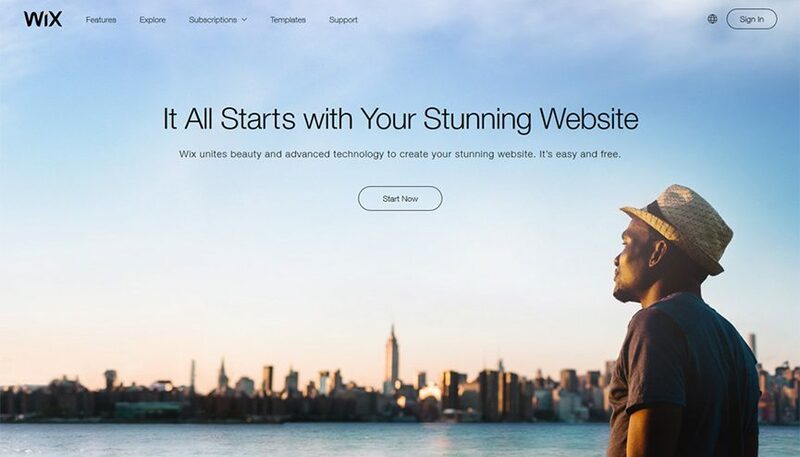 Wix ADI gives you a unique website. And, ADI is completely optional; if you want to design your website on your own, Wix allows you to do that. Freeze Header and Logo: Keeps your website header and business logo always at the top, when users scroll down to browse pages. Face Magic: Automatically optimizes images with faces so that they appear crisp and stunning. Easy Hide and Rename: Allows you to edit section names, and hide sections fron the site’ navigation menu. Add Pages and Sections: Adding pages and sections becomes easier with this option. The Wix HTML5 editor can fall flat on its back if not ably supported and enhanced with the many add-ons and integration options available. 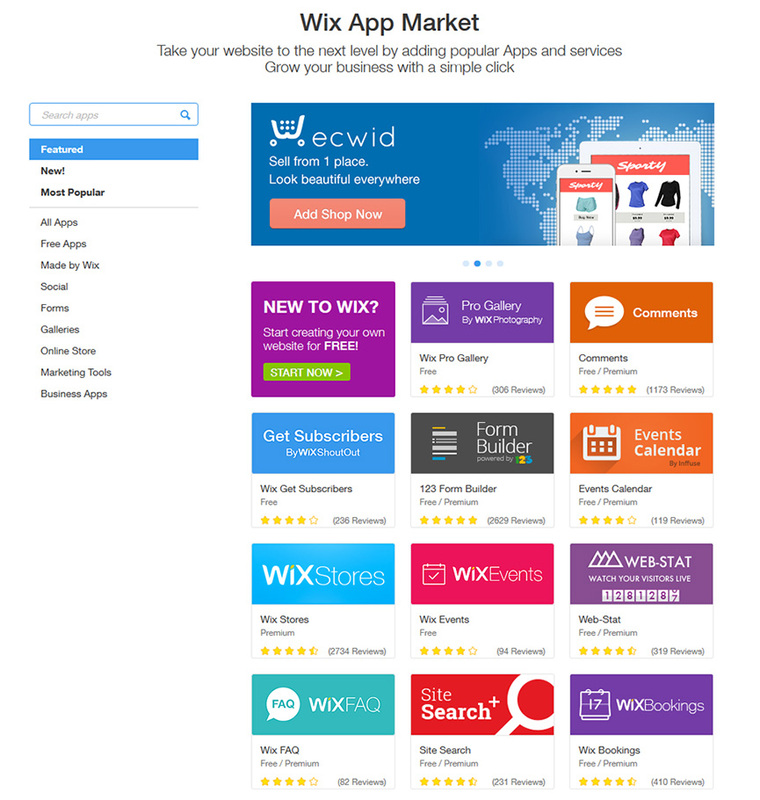 The Wix App Market offers several useful integrations that can add value to your Wix website. 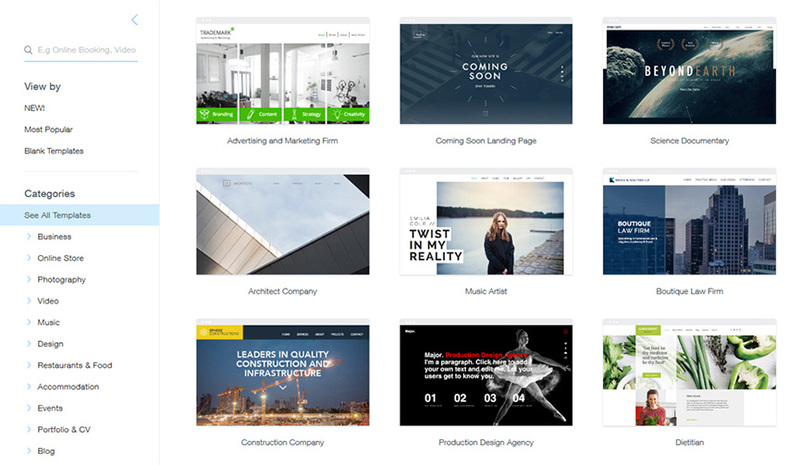 Check out the free and premium apps, and get those that add value to your website. These apps and add-ons are spread across categories like social media management, sales and promotions, galleries, marketing tools, business apps, and Made by Wix apps. Form builders, site search, schedulers, social media streams, live chat, testimonials, customer reviews and ratings – you name it, and there is an app for it. Wix’s app store records 15 mn+ app downloads annually. 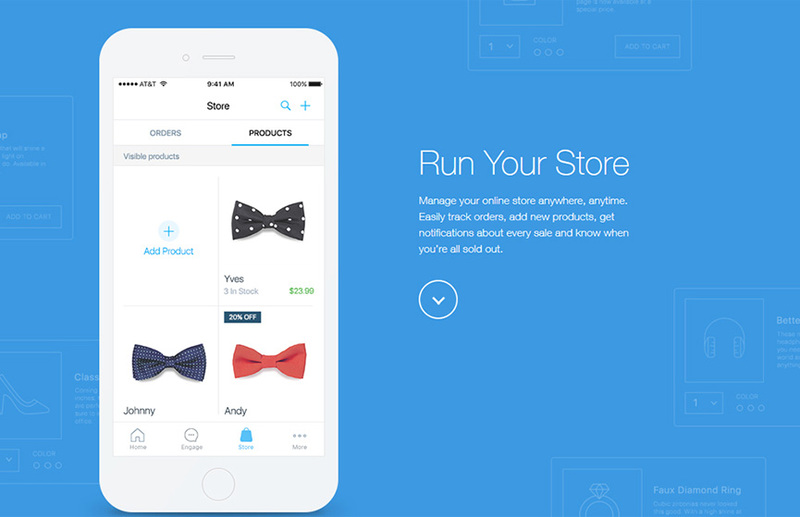 This app store is among the major differentiators for Wix. With so many developers working to add amazing and highly value adding apps to the Wix app market, the potential of your website can always be enhanced by integrating these into your website. 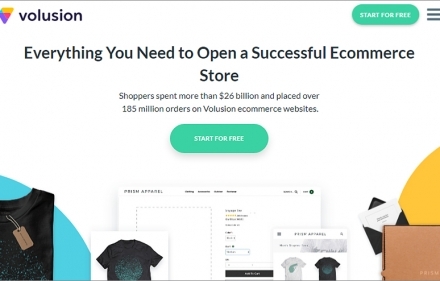 Among the most popular integrations and add-ons are dedicated online store extensions such as that for Etsy, Wix Hotels premium booking and reservations system, Site Booster, website profile systems, etc. Wix uses AJAX and HTML5 to build your web pages. Now, there’s a lot of false information about Wix’s SEO capabilities, with clams being made that Google’s bots are not able to understand or crawl Wix websites. However, Google has clarified that it’s bots are able to crawl both AJAX and HTML5, and don’t give preferential treatment to any language, which means your Wix web page is as good a candidate for the #1 Google SERP rank as any other web page. 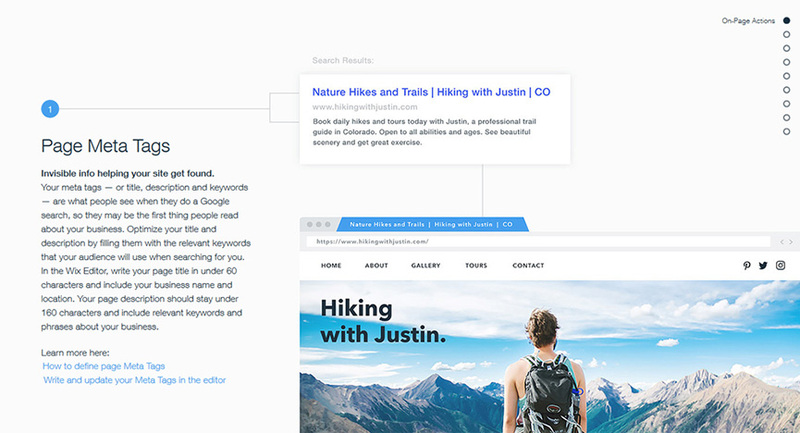 Wix allows you the option of optimizing your web pages’ URL, so that you can insert target keywords in it, and make it more relevant for featuring in search results. Most other website builders don’t offer this facility. Also, it has the basic SEO features to help you add title tags, meta tags, image alt tags, etc. to make your website optimized for search engines. Mobile optimized websites rank better, especially for Google mobile searches, and Wix delivers you all the SEO advantage to be had with its mobile optimized websites. Wix offers free web hosting, which means you can create your free website without having to pay for web hosting fee to any service. Your website is hosted on Wix domain. Not only does this help you save money, but also takes the hassles of working out the hosting plan and settings out of the website creation experience, making it more hassle free. On the flipside, note that Wix does not allow you the option of exporting or archiving your website, so switching to another website builder is not possible. This is expected, considering the website creation technologies used by Wix are pretty different from what other website builders use. Here’s another unique aspect of creating a website with Wix – its mobile website builder. You can make your mobile website version different from the desktop website in a lot of aspects, such as re-arranging content elements, hiding some content, etc. This is different from responsive website creation, as here, you can control what your visitors see differently when they browse your website from a mobile device. Another amazing feature is the Mobile Action Bar, which houses buttons to connect users to your email address, social profiles, or see store location on map. Users can tap the button and enjoy the corresponding functionality. This offers you a lot of scope to get calls, emails, etc from users accessing your content on mobile devices. Mobile Optimized View is another feature, which optimizes your HTML5 website for mobile viewing. You can just use the Wix Editor, click on the Mobile icon, make changes, and publish your mobile website directly. Extending the convenience and ease of usage of Wix website builder is the expansive range of customer support options it offers. You can shoot out queries in emails anytime, and expect a response within 48 hours. Most of the times, they try to point you to the right knowledge base links to help you overcome your hurdles. You can call their customer support team anytime between 9 am to 8 pm EST. If you are in a time zone with minimal business hours overlap with this slot, you can schedule a call at a convenient hour, and Wix support personnel will call you back. Wix is among the best when it comes to on-screen help, as most content components have help buttons which you can click to understand how you can use them. Users don’t have to open a new window, or stop their work to understand the option, all because of these on screen tips. Wix Help Center is a power packed portal with lots of tutorials n text and video. Once you get the hang of using Wix, you can be sure that you will find guidance on the advanced feature right here. Wix is a pretty good option to create a free website, because it lets you create unlimited web pages even in the free plan. Plus, you get 500 MB free storage space and 1 GB bandwidth. Also, free and secure hosting is included in the package, which makes all the more hassle free for you. 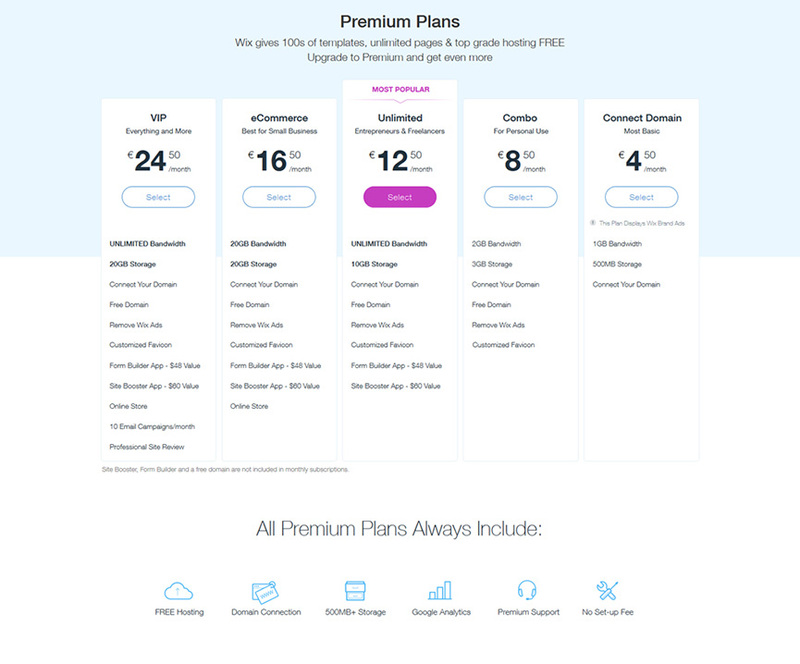 Whereas most online website creators offer 3 premium plans, Wix offers five different options, when you decide to upgrade from the free website – Connect Domain, Combo, Unlimited, Ecommerce, VIP. Based on your requirements, you can choose the one that suits you best. Whereas plans with comparable features from competing website builders are lower prices, Wix retains the advantage of making it super easy and super-fast for you to use its expansive range of niche-specific features. Making sense of traffic – Wix offers you web stats so that you can gauge the quantity and quality of traffic on your website in real time. Also, SEO Analytics enables you to make sense of the stats, and see how your pages are faring against competitors, in terms of Google’s SERPs. Organizing visitor information – With contact forms, appointment booking, schedulers, and Content Management with CRM functionalities, all help you organize customer interactions in a meaningful manner right in your Wix admin panel. Social Media Integration – With Wix, you can publish all your social media updates on the website in real time, using widgets for live feeds. Then, there are all kinds of buttons for Facebook Like and Share, Google 1+, Pinterest and Tumblr Likes, and what not. You can also create a discussion forum around your business or website. Online selling – With Wix’s e-store creation capabilities, you can quickly set up an e-shop with descriptive product pages, advanced shipment and taxation controls, awesome payment gateway integration, and massive sales and marketing functionalities. You can integrate your Etsy and other stores into the Wix store, manage advanced promotional campaigns, distribute holiday badges and coupons, and do a lot more to make seeing much more manageable and fun. There are at least 3 major factors where Wix excels as a website builder tool, and comes to the fore as a perfect pick, especially for people trying to create their first website. All its design technologies and features are aligned towards the common goal of making is super easy for the user. 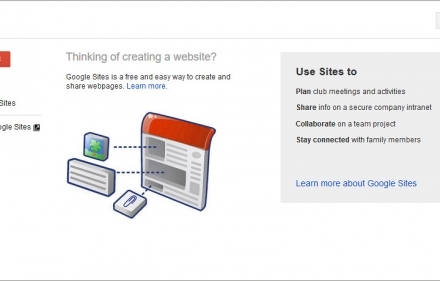 Adding pages, renaming page sections, adding widgets, publishing the website – all can be done with a click. 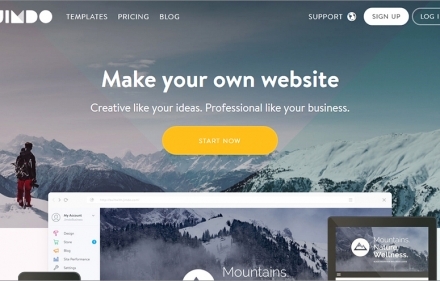 Wix takes all investments of time, effort, and money out of your first website creation experience, offering free templates, free hosting, free domain, and the inimitable ADI engine which creates your website in a jiffy. Then, Wix wins in terms of offering purpose specific functionalities. Your restaurant website can use the reservation feature, your music store can offer digital downloads, and your event website can take reservations! Wix is a highly recommended option for first time website creators because of the unmatched convenience, and for professional website creation because of its regularly updated and ever expanding pool of business centered functionalities. This means that despite the much talked about issues of problems in template switching and premium plans pricing, Wix is a relevant, scalable, differentiated, and empowering platform of website creation. Definitely - yes. Since sites created on WIX look much better than most of sites created by using any website builder including premium ones. Apart from this, if this is your first website and you're a novice in web - Wix will be ideal website builder for you. It's easy, convenient, intuitive and at the same time offers wide opportunities. 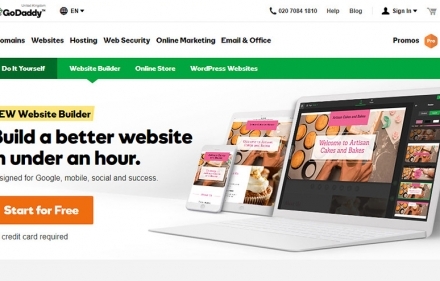 Next storyWhat is a Website Builder and How Does Website Builders Work?